← What can we learn from the winners (and losers) of the Olympics? 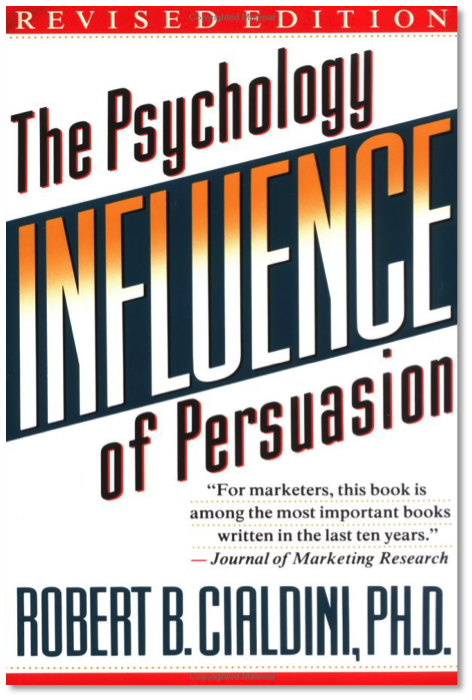 Cialdini has identified 7 key influencers of persuasion (based on 35 years of evidence based research): Weapons of influence (aka reason why), Reciprocation, Commitment & Consistency, Social proof, Liking, Authority and Scarcity. Reason Why – Attaching a reason to a request increases the success rate: “I have 5 pages, can I use the Xerox machine before you because I’m in a rush” had a success rate of 94% vs.60% success rate when no ‘reason why’ was given. Showing potential customers the most expensive item first then working downwards in price leads to an increase in the amount spent (as the next products seem cheaper in comparison). Social obligations – Humans inherently dislike being indebted to someone, so much so that often a small gift or favour will lead to a larger reciprocal response. This fact is exploited worldwide, e.g. Hare Krishna’s who offer a ‘gift’ of a flower when soliciting for donations (which they refuse to take back). As the receiver cannot unburden themselves from the subconscious debt, the social pressure to donate leads to a higher donation rate than merely soliciting alone. An Indian supermarket sold £1000 of cheese in a few hours by inviting customers to slice their own free samples. Reject & Retreat – This technique consists of first demanding a high price (or a large favour), then waiting for it to be rejected, only to follow this demand up with a smaller one, (that you really wanted all along). Quote from a child: ‘If you want a kitten, first ask for a pony’ (Ed). POW’s in Korea who were made into collaborators, started co-operating when they were labelled and classed themselves as a collaborator. People are influenced by what others do. At an unfamiliar event or situation, we look to others on the correct etiquette. This is exploited for example, in bars or at church collections. The tips/donations are sometimes ‘salted’ by having money already placed there or having a stooge give money to stimulate others to tip. This effect is amplified by how similar the person whose actions we are watching are to ourselves. As a rule, we prefer to say yes to the request of those we like over those we don’t. There are several key properties that determine our view of people: Attractiveness, similarity, compliments, contact & co-operation, conditioning and association. Studies found we automatically attribute traits such as talent, kindness, honesty and intelligence to attractive people. It is no co-incidence that ‘attractive’ political candidates received two and a half times the votes of unattractive rivals. We like people who are similar to us, with the same views, interests, beliefs and values. We therefore need to find areas of shared interest to increase rapport and connection. Joe Girard won for twelve years straight the title of ‘Number one salesman’, selling on average five cars or trucks a day. His formula behind his success was simple; he provided a fair price, and someone they like to buy from. One of his key tactics however was to employ the use of compliments. Every month he sent every one of his 13,000 former customers a holiday greeting card containing a personal message. The holiday greeting changed from month to month (Happy New Year, Happy Easter etc. ), but the message printed on the face of the card never varied. It only read ‘I like you’. Endless chain – When a salesman approaches the person recommended, saying “your friend recommended this for you” it increases the chance they will make a purchase. Turning the salesman away is difficult as it’s like rejecting one’s friend. The greater the perceived authority of a person, the more likely people are to comply (cf the Stanley Milgram experiments). Hospitals have a 12% daily error rate. This is because, nurses and junior doctors will very rarely challenge the decision made by an authoritative figure, despite receiving potentially lethal, or bizarre requests. We often perceive and interact with people with authority differently. The more power a person is deemed to have, the more generous people are when estimating their height, and the more cautious we are with our conversations. We are more motivated to act if we think we are going to lose something, than if we are to gain something. ‘Save £50 a month on…’ would not be as effective as ‘You are losing £50 a month on…’. An item that is scarce is more desirable than one that is freely available. The high pressure environment, like an auction can lead an item being sold for an elevated price as the buyers fear losing out to another person. This book was a pre-curser to Behavioural Economics and was one of the classics in business. Its examples may be a bit dated but its core principles remain as powerful. Overall, I feel the latest BE books have moved the subject on. This entry was posted in Behaviour change, Behavioural Economics, Decision making, Management, Persuasion/Influence. Bookmark the permalink. Hi, Great review! thanks a lot! I was wondering what other books on this subject do you recommned when you say “I feel the latest BE books have moved the subject on.”. Thanks in advance!